Above: This pecan-packed beauty is 100 percent made in New Mexico. LET NEW MEXICO’S top food crop add pizzazz to your holiday menus. Rich in fiber, antioxidants, phosphorus, magnesium, heart-healthy fats, and anti-cancer and anti-aging properties, pecans can enhance any meal. This selection of recipes offers options ranging from breakfast to dessert, and everything in between. Should you, like the pros, stock up on pecans for the year ahead, make sure to keep them in the refrigerator or, better yet, the freezer. Wrap them tightly, because they can absorb the flavors of other foods easily. If you enjoy outdoor cooking, talk a farmer out of some pecan wood, in logs, chunks, or chips, or save up a bunch of the nuts’ shells. All make good fuel for barbecuing and grilling; the wood gives off a somewhat sweet and toasty smoke. 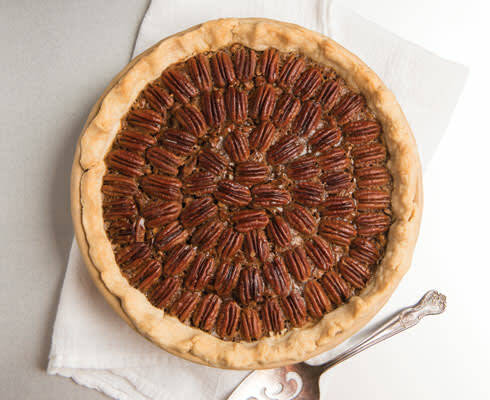 I vote for changing the slogan to “As American as pecan pie.” On Thanksgiving, I want a filling made from a star ingredient indigenous to North America. This particular pecan pie is a beauty, chock full of many more nuts than the oft-used recipe on the back of the corn syrup bottle. Can you use a store-bought crust? Sure, but if it’s Thanksgiving, or your loved one requests pie instead of cake for a birthday, consider making your own. It’s not nearly as tough as the manufacturers of those prefab crusts would like you to believe. For the most beautiful slices, let the pie sit for a minimum of two hours before slicing. Pecan pie can be made a full day ahead, if you wish. 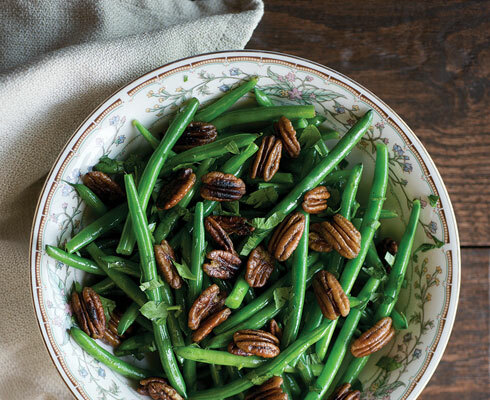 Add crunch and zing to your Thanksgiving buffet with a green bean salad. Give goopy green bean casserole a rest without losing a rare green vegetable on the feast-day table. This fresh, hearty salad’s zingy dressing is an excellent counterpoint to Thanksgiving’s rich array of savory flavors. Prepare an ice bath. Half-fill a large bowl with ice, add water to level of the ice. Place beans and salt in a large saucepan and cover beans with water. Bring beans to a simmer. Cook briefly until tender, 5 to 8 minutes. Drain off water and plunge beans into ice bath, which helps them retain their bright color. When cool, drain again. Whisk together oils and vinegar in a small bowl. Toss beans with mixture and lay out on a platter. Tuck endive or lettuce around edges, if you wish. Scatter ham, pecans, and parsley among beans and toss lightly. Sprinkle with a bit of coarse salt and serve at room temperature. Serve this dressing alongside the Thanksgiving bird. Preheat oven to 325° F. Toast bread cubes on baking sheets for about 25 minutes, stirring once or twice, until lightly brown and crisp. Dump them into a large bowl. Butter a 9-by-13-inch baking dish. Warm butter in a large skillet over medium heat. Stir in vegetables and sauté until very soft, about 7 minutes. Stir in pecans and sauté for an additional minute. Add sage, thyme, salt, and pepper and scrape into bowl of croutons. Add stock a cup at a time, until bread is very moist but not soupy. You will probably use 2 to 3 cups of stock. Taste and adjust seasoning if you wish. Whisk eggs and baking powder together and mix them into dressing. Spoon dressing into prepared baking dish and cover it with foil. Bake for 25 minutes. Uncover and continue baking 15 to 20 additional minutes, until lightly browned and crusty on top. 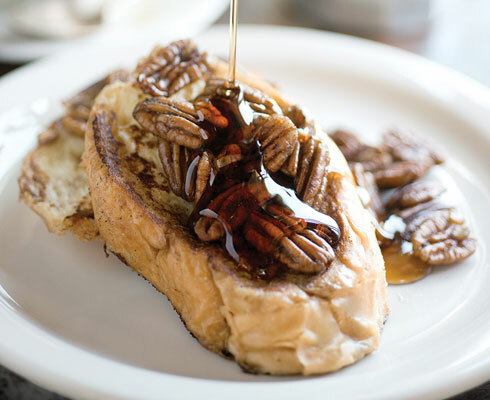 French toast gets a protein boost when topped with pecans. 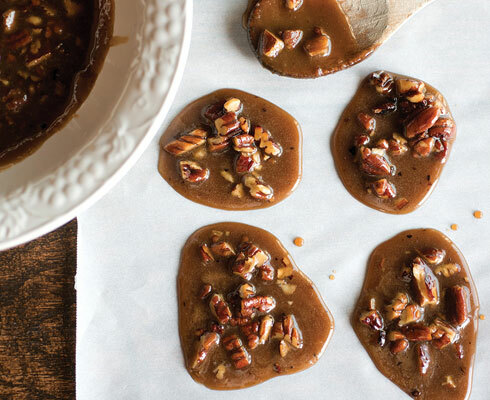 Pralines are pecans held together by a candied syrup. The deeper, more caramelized tones of this version come from the inclusion of piloncillo, a raw Mexican sugar, much richer in flavor than American brown sugars. Look for the small hard cones of piloncillo in stores that offer a good selection of Mexican or Latino ingredients, or order from the Santa Fe School of Cooking (santafeschoolofcooking.com). If you can’t find it or just don’t have time to look, use dark brown sugar in its place. Combine all ingredients except vanilla in a large heavy saucepan. Warm mixture over medium-low heat, stirring occasionally, until piloncillo melts. Raise heat to medium and continue cooking, but now stir constantly, until mixture reaches 238° F to 240° F (called “soft ball” stage in confectionery parlance). Add vanilla and remove pan from heat. Continue stirring more-or-less continuously to help cool candy. When mixture becomes creamy and cloudy, and pecans remain suspended while stirring, spoon mixture onto wax paper, about 1/4 cup per praline. (You can make any size pralines you want, really, but this size gives you about 1/1/2 dozen.) Work quickly, before the candy hardens in pan. Pralines will set as they cool. Best the day they are made, pralines can be kept, tightly covered, for up to several days. Note: Cones of piloncillo can be found in different sizes, though many are about 2 ounces. If you need to chop one to get the amount needed for the recipe, soften it before attempting to chop it. To soften, zap the piloncillo in a microwave about 10 seconds, or as needed. Be careful of your fingers when cutting its slick surface. Adapted from The Border Cookbook, © 1995, Cheryl Alters Jamison and Bill Jamison, Harvard Common Press. Quinces are a winter fruit found in southern New Mexico around areas where pecans grow. They look a bit like apples, but must be cooked to be palatable. 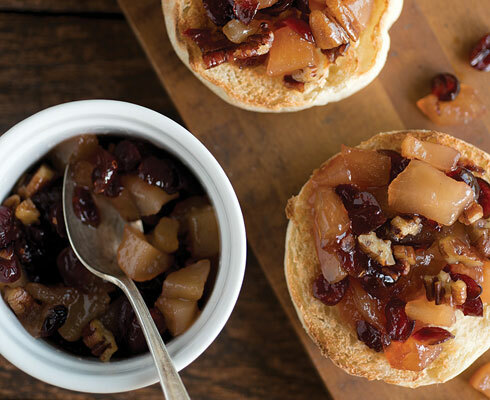 Spoon this compote on bread or just eat it like cranberry relish. It lasts for days refrigerated. Combine juice and sugar in a heavy saucepan over low heat. Peel and core quinces and apples, and cut them into small bite-size pieces, placing them in the juice as they are cut. Bring to a boil over high heat, then cover, and continue cooking at a boil until quinces are crisp-tender, 30 to 35 minutes. Stir in cranberries and continue boiling uncovered until they pop and all fruit is very soft and suspended in thick soupy liquid, about 20 additional minutes. Add a little water if the fruit begins to get dry before it is soft enough. Stir in pecans and remove from heat. Cool, spoon into jars or a bowl, cover, and refrigerate overnight. Serve by the spoonful. Adapted from A Real American Breakfast © 2002, Cheryl Alters Jamison and Bill Jamison, William Morrow/HarperCollins Publishers.